I used approx 40gm of oddments of 8 ply 100% Wool in light purple for the background and an oddment of purple for the star. I worked the outline in oddments of 2 shades of green. You will also need one small fancy button and a set of 4 double pointed needles in a size to obtain the correct tension. M1 = Make 1. Pick up the bar lying between the sts and knit into the back of it. SSK = slip slip knit. Slip the next st from the left needle knitways, slip the next st knitways. Return both sts to the left hand needle in their new twisted states and knit them together. This forms a left slanting decrease. Cast on 47sts and work 65 rows st st. Cast off. Rejoin yarn and work the remaining 4 points in the same manner. 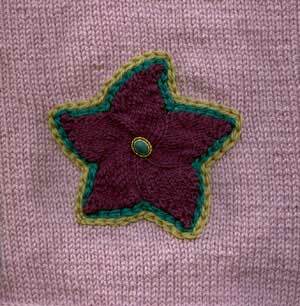 Sew star to base, sew small button to centre of star. Using chain st, outline star twice using 2 shades of your chosen colour.